Chelsea needs to watch her back. Her bigger, louder and brighter sister at Hampton Court Palace is slowly but surely stealing her crown. Chelsea may be smarter, better educated and popular with the establishment, but compared to Hampton Court she is starting to look a little too prim and proper. 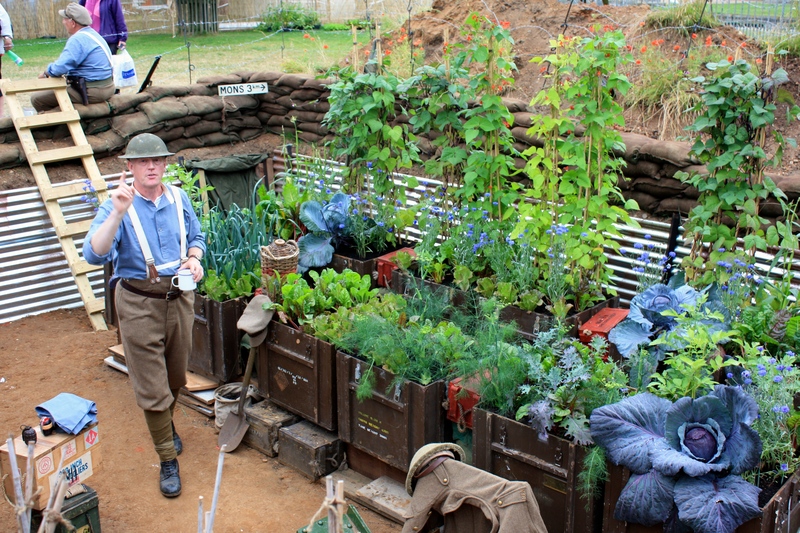 I used to view The RHS Hampton Court Palace Flower Show as very much a poor relation to Chelsea. 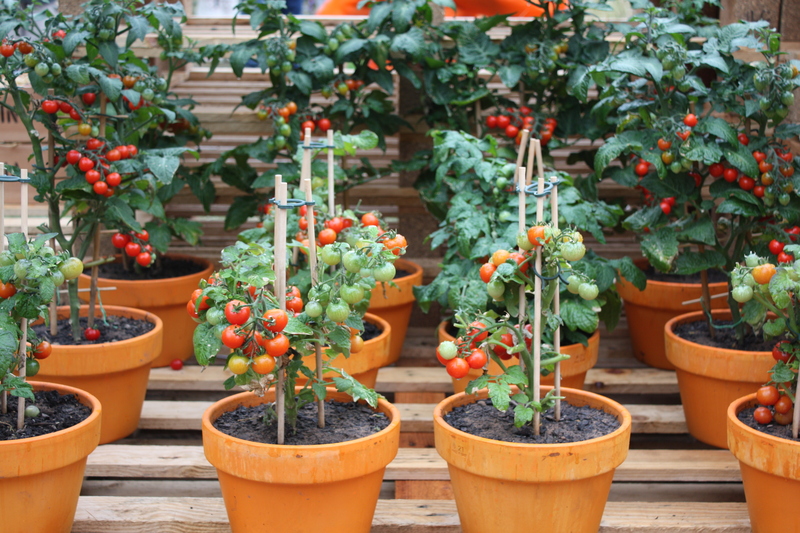 I doubt I will ever warm to its overtly commercial side, over which I wish the RHS would exercise a little more restraint, but whilst Chelsea appears increasingly stuck in a stylistic rut, Hampton Court gets more and more daring every year. For the first time, I think I prefer what Hampton Court has to offer: more variety, more adventure, more excitement and more inspiration for real gardeners. 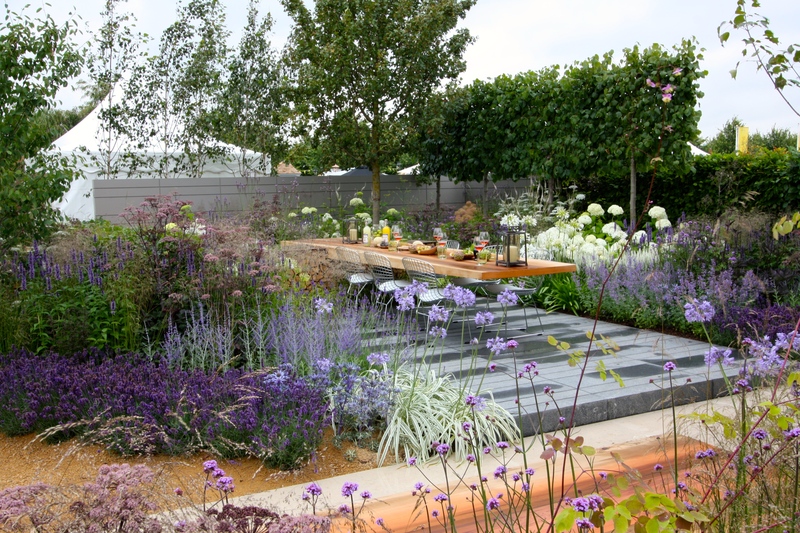 Hampton Court’s gardens were split into four categories: the big-money show gardens; small but perfectly formed summer gardens; ‘Your Garden, Your Budget’ gardens (with price tags ranging from £7,000 to £15,000) and finally conceptual gardens. The result, to my mind, was a well balanced spectrum of size, style and cost, offering something of interest for everyone. The quality of gardens at Hampton Court has come on in leaps and bounds over recent years, but still one or two, disappointingly staged by garden centres, fell wide of the mark. That aside, I have never been harder pressed to choose a favourite, so here’s a selection, about which I hope to write in more detail shortly. 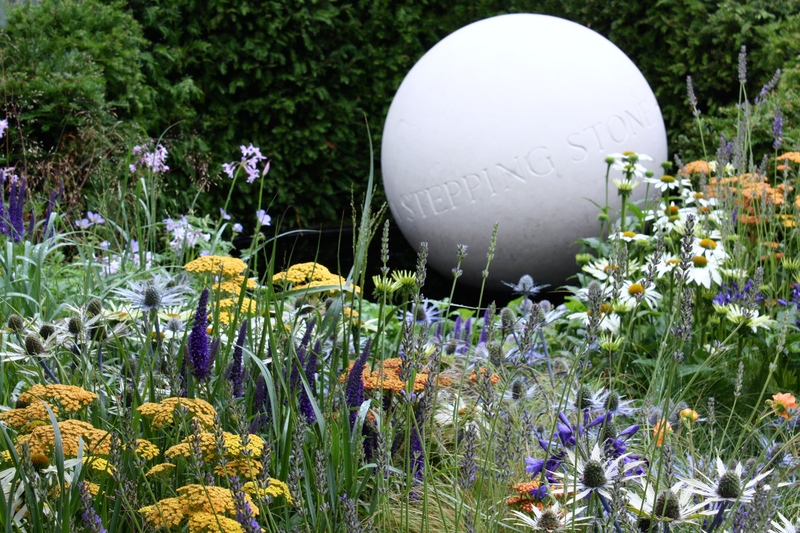 If I had to choose my number one it would be Vestra Wealth’s garden entitled ‘Vista’, designed by Paul Martin. This really was a garden for entertaining on a grand scale and frankly made me green with envy. The quality of the materials and plants used to create this superlative design was second to none. In ‘A Space to Connect and Grow’, designer Jeni Cairns had thrown in everything bar the kitchen sink. 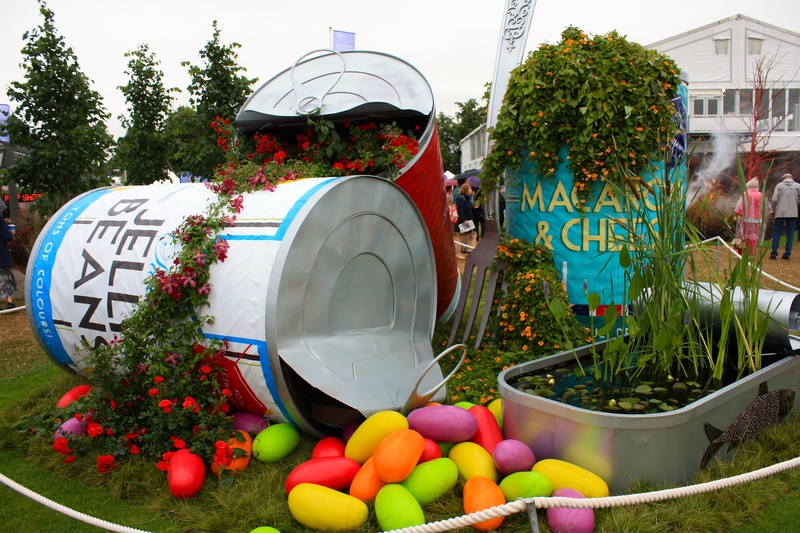 In fact there probably was a sink amongst the recycled and upcycled materials used to create this vibrant garden. 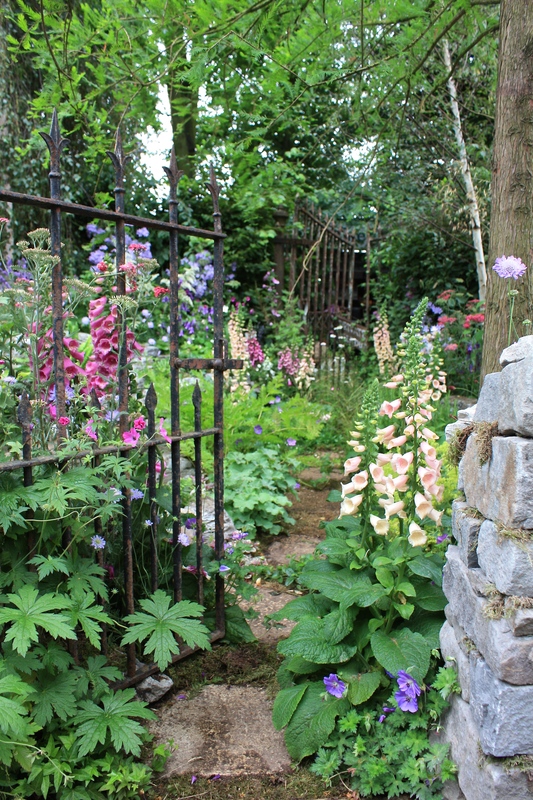 Interest and detail was incorporated into every corner, justly earning the garden both a gold medal and the award for best summer garden. Unlike Chelsea, many of Hampton Court’s show gardens are designed to be viewed from three sides, or in the round. Jeni had embraced this opportunity, treating the boundaries of the garden with as much love as the centre. The choice of plant material was suitably upbeat, including zesty yellow eremurus and plant of the moment, Echinacea ‘Hot Papaya’. I am not sure who had the idea of theming the conceptual gardens around the seven deadly sins, but it was an inspired decision. Rachel Parker Soden’s ‘Lust’ included a neon Peep Show sign draped with Gloriosa superba ‘Rothschildiana’ (top of post), orchids exploding from a red velvet settee, and suggestive anthuriums parading themselves gaudily behind steamed-up windows. Never have plants looked more suggestive. Steam rising from ‘Wrath – Eruption of Unhealed Anger’, designed by Nilufer Danis, drew unsuspecting crowds in, rewarding an unlucky few with a soaking from sudden jets of water. 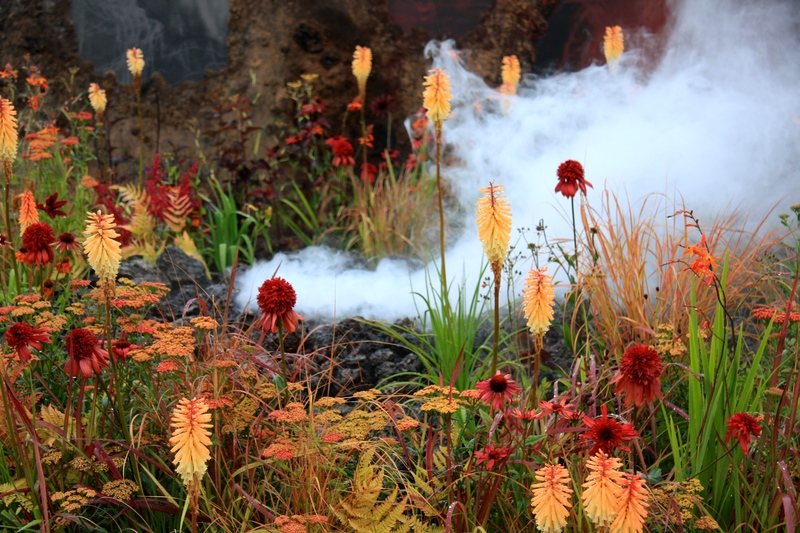 As an evocation of a volcanic landscape it was near perfect; flame coloured kniphofia, achillea, crocosmia and echinacea mingling with Dryopteris erythrosora and grasses, all emerging from a landscape of charred black rock. Ominous rumblings from the smoking mound added to the brooding, sensory experience. If ‘Lust’ wasn’t provocative enough, Katerina Rafaj drew attention to the vast amount of food we waste in her garden entitled ‘Gluttony’. 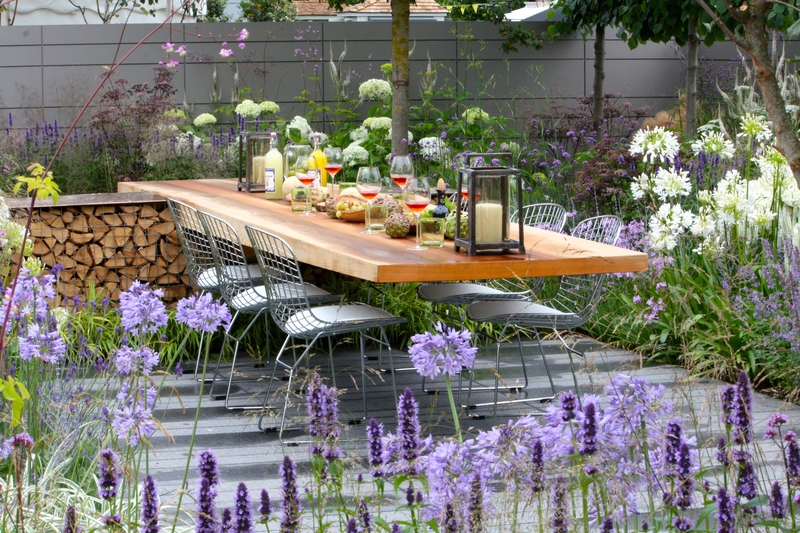 Despite the relative lack of planting the garden was awarded a gold medal. 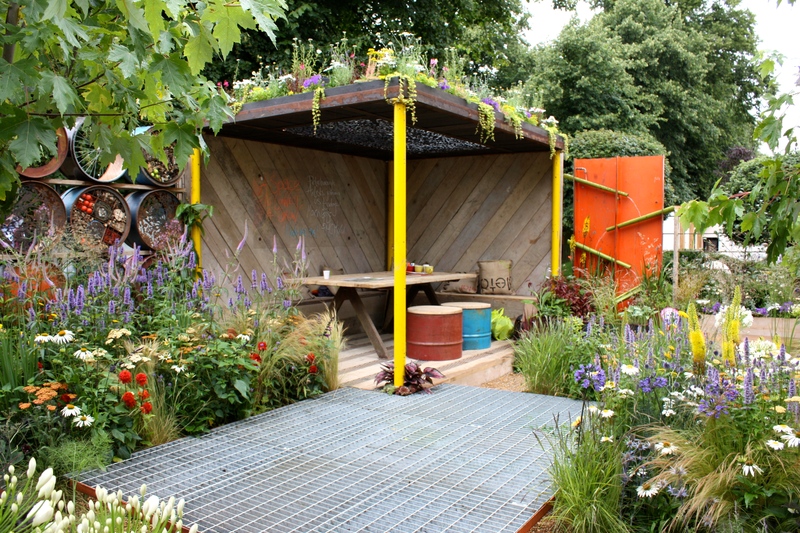 Equally thought-provoking was The World Vision Garden designed by John Warland. This large show garden celebrated the transformation of the Antsokia Valley, part of Ethiopia hardest hit by famine thirty years ago, from drought stricken wasteland to fertile farmland. 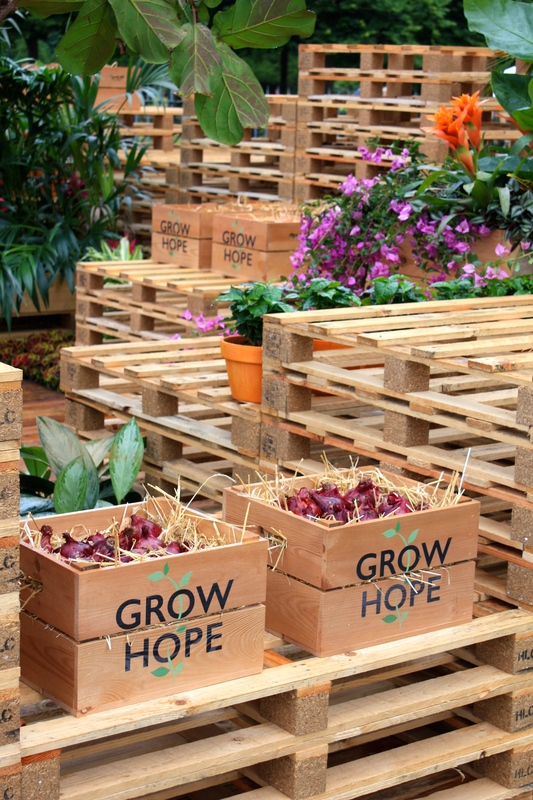 Orange-clad assistants helped visitors interpret the garden’s exuberant displays of tomatoes, maize, cut flowers and fruit, all products that Ethiopia now exports to the rest of the world. 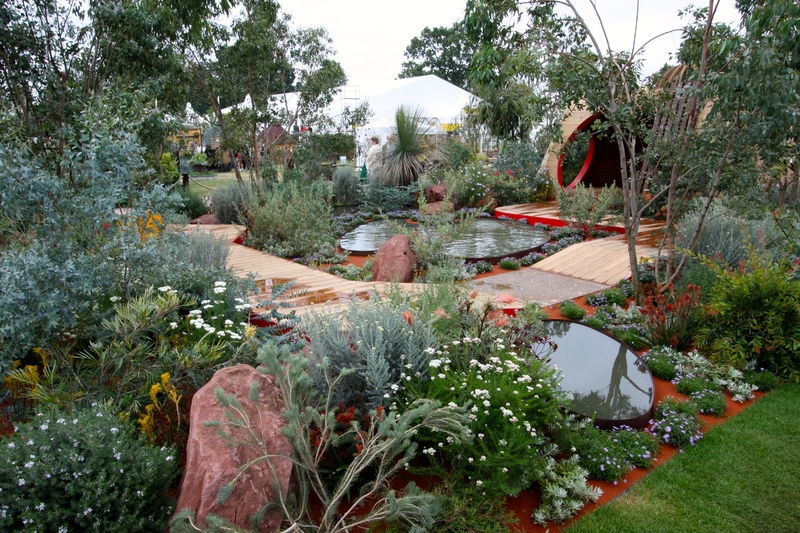 Having been absent from Chelsea this year, Hampton Court welcomed back Australia and Trailfinders with a superb garden designed by Jim Fogarty for Royal Botanic Gardens Melbourne. Naturally this huge plot had a completely different feel to any other garden, featuring a palette of plants from the states of Victoria and the Northern Territory. Many plants were unfamiliar to me, but the varied textures of silver foliage set against red Devonian sandstone were easy to appreciate without any knowledge. A timber-clad structure at the back of the garden symbolised the rock formations of the Northern Territory, such as Uluru and the MacDonnell ranges. The sinuous layout of paths and pools was inspired by the Rainbow Serpent, a dreamtime creature from Aboriginal culture. We return to the UK for my last three gardens. 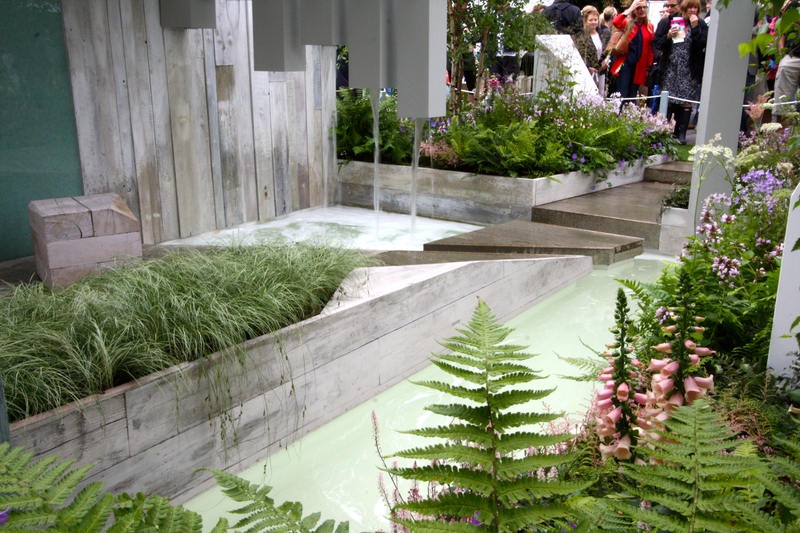 The first was the winner of a competition run by TV’s The One Show, designed by architecture student Alexandra Noble. The garden featured nine regularly spaced reflective pools representing the underfloor heating systems the Romans knew as hypocausts. 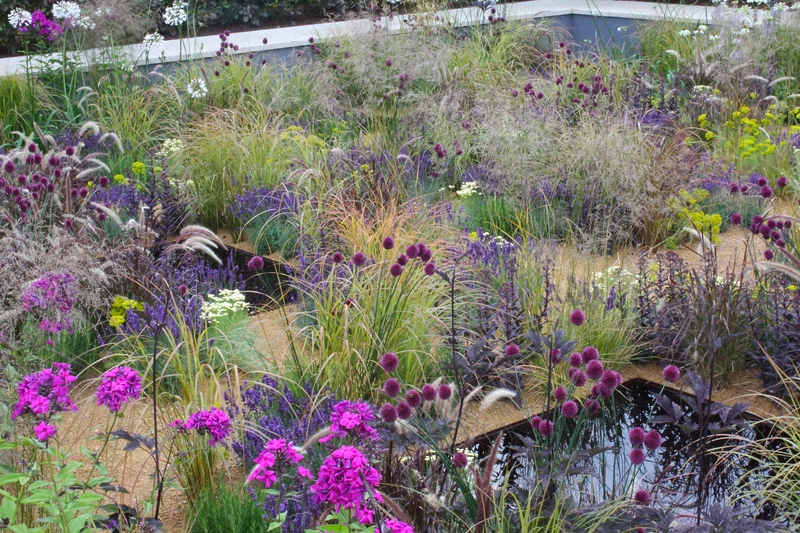 Fine, billowing grasses were employed to create the impression of steam rising from the water, with other planting in shades of purple and lime green. This was a wonderful design for a sunken space and I am sure we’ll be seeing more from Alexandra Noble in future. Nothing could have been more English than The Forgotten Folly, designed by Lynn Riches and Mark Lippiatt. The garden centred around a ruined stone building sitting high above a tumbling stream. Exuberant planting demonstrated how garden plants can successfully be combined with native wildflowers to create a haven for wildlife, as well as a beautiful space for humans to enjoy. Finally, a garden which could have been a complete shocker, the NSPCC Legacy Garden designed by Adam Wollcott and Jonathan Smith. Four periods of garden style, from Victoria through to the present day, were represented in this small summer garden. The progression was marked by changes in the paving and plants, beginning with a shaded Victoria fernery, then an Edwardian rose garden, moving on to the the kind of 1970’s gaudiness I remember from my childhood. 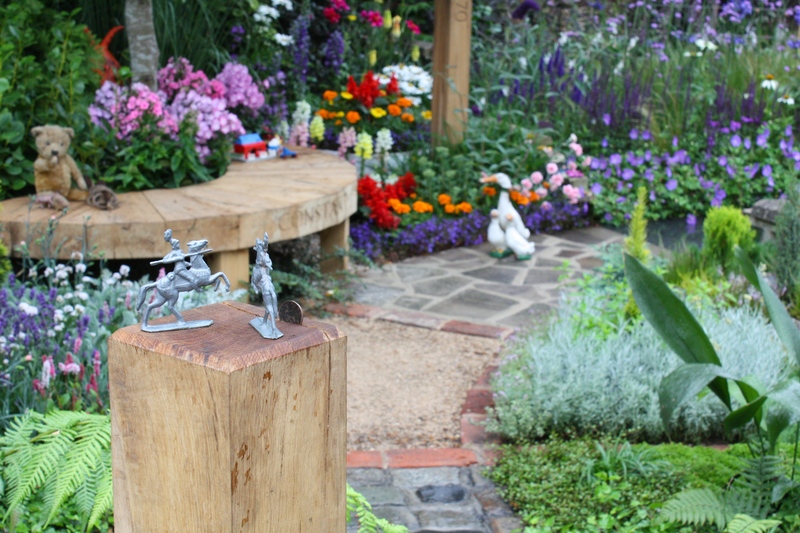 The present day section was filled with a familiar assemblage of perennials, but it was the humorous accessories, the teddybears, plaster ducks and lead soldiers, that really brought this whimsical garden to life. I hope I have managed to illustrate the enormous stretch of the gardens at Hampton Court Palace Flower Show this year and that you found something among them that inspires you. Already I am looking forward to seeing how the show moves forward again next year. Chelsea needs to take heed of her more worldy, provocative sister and let her hair down, just a little so as not to frighten the horses.